Christina Broughton, RN, NP | Glen Rose Healthcare, Inc.
Glen Rose Healthcare welcomes Christina Broughton, RN, NP. Christina moved to the area in 2016 with her husband and son along with their Goldendoodle, Cadet and African Gray Parrot, Bertie. 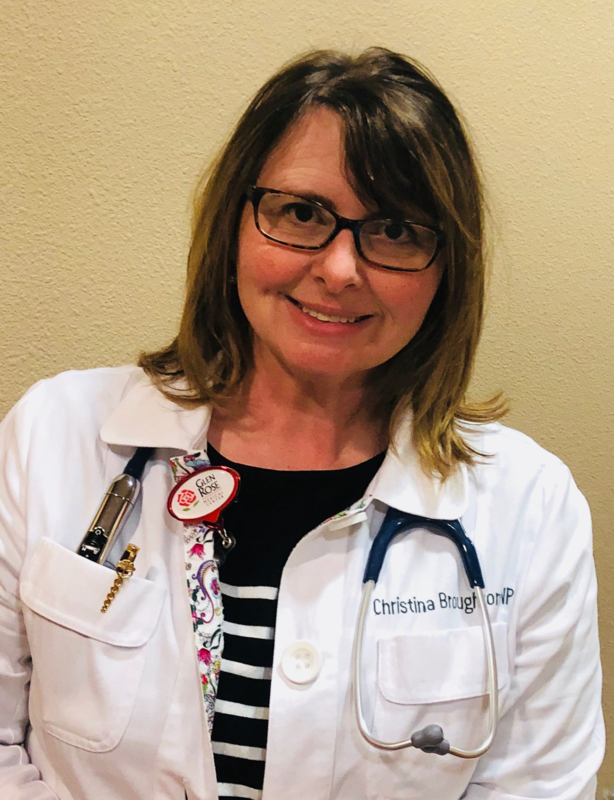 Christina began her love of medicine in the late 1980’s as a candy striper, from there she advanced in the medical field as a registered nurse, a registered radiologic technologist, a mammographer, and a forensic radiographer and in 2017 completed her Family Nurse Practitioner degree. She is also a member of the Federal Disaster team and has been deployed several times including Hurricane Katrina, Rita and Haiti. She has worked as trauma certified emergency room nurse, Pre-OP and recovery nurse, and as a charge nurse/house- supervisor. In her off time, she enjoys visiting her son at Tarleton State University, photography, fishing with her husband and exploring the DFW area. She is excited to be working as a Family Nurse Practitioner under Dr. Karen Burroughs and as a part of the Glen Rose Healthcare team, and is currently accepting new patients and most insurances.